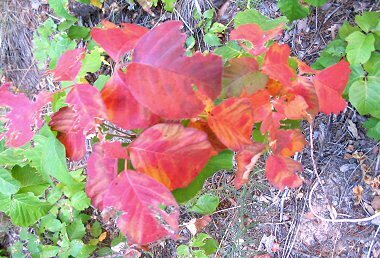 Poison Ivy is a member of the Cashew or Sumac Family. It appears as a small shrub to 2 feet in height or as an ascending vine. Leaves grow in groups of three to 3 inches in length and can vary from oval and smooth to notched or toothed. It typically grows in wet areas with good soil in canyons, ravines and disturbed areas at elevations between 3000 and 8000 feet. All parts of the Poison Ivy plant contain an oil that can cause an itchy rash. If you are exposed to the plant, washing yourself immediately in cold water can mitigate the worst of the symptoms. 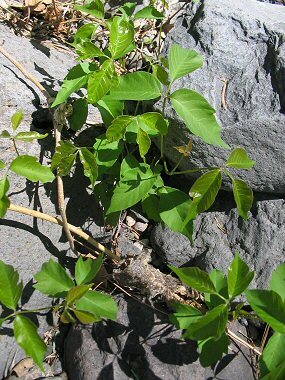 Poison Ivy blooms between April and September and produces small, greenish-white flowers to 0.25 inches in width which grow in loose clusters. In the fall, the leaves turn a reddish orange (aren't they pretty? ).